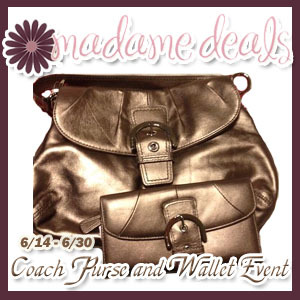 Thank you for joining us for this Coach Giveaway! Selena Thinking Out Loud With Purpose is SO excited to be promoting this AWESOME Giveaway for the Ladies! This giveaway will run from 6/14 12:01 am EST thru 6/30 11:59 pm EST. If you've entered any of our other Madame Deals Events, this will be easy for you. There is 1 mandatory entry of a blog comment plus Facebook likes for bonus entries. I am SO mismatched, it's a pity. LOL I'd would actually and for real, jump up and down and clap my hands to win this Coach prize. My general fare is thrift store things... I'd love something really fab for once. Everything is pretty much mismatched with the exception of one pocketbook and wallet. That's only because the wallet came with the bag.